1958: Tangier, Morocco. Twenty-year old Alice Shipley is trying and failing to adjust to life in Tangier with her new husband, John. Overwhelmed by the heat, dust, and foreign culture of the city, Alice hides herself away in their small apartment. At least until her old college roommate Lucy Mason turns up out of the blue. Alice is surprised and dismayed to see Lucy after an accident caused a rift in their friendship more than a year ago. However, Lucy is fearless and carefree in the face of Tangier, and Alice tries to convince herself that the company of an old friend is just what she needs to adjust to her new life. This debut novel by author Christine Mangan contains some technical flaws that threatened to lose my interest in the opening few chapters. The use of foreshadowing is used as a blunt hammer with which to beat a reader over the head. The prose tends to be needlessly wordy, and the use of run-on sentences caused me to grit my teeth more than once. However, these are the small woes that plague English teachers. I found myself truly enjoying this novel once I settled into it. The obsessive friendships between women seems to be a prevalent theme in modern literature. Shari Lapena’s A Stranger in the House, and Ruth Ware’s In a Dark Dark Wood are recent examples of novels that explore the labyrinths of female companionship, and how that connection can often lead into less desirable territory when one friend suspects that the other may not share her depth of feeling. I enjoyed Mangan’s novel far more than Lapena’s and about on par with Ware’s because Mangan employs a great flare for generating suspense and unease. The chapters switch back and forth between Alice’s perspective and Lucy’s, and due to a short but meaningful prologue we are aware that at least one of these narrators is unreliable. The fun is in trying to discover which one. Mangan takes a different path from the aforementioned authors by putting her novel in a historical context. I confess to being only vaguely aware of the struggle of Morocco in the 1950’s to liberate itself from French occupation. Sadly, those wishing to learn more about this time in history may come away disappointed. I would love to have had more of the narrative to center around the political and social turmoil of Tangier during this period. The setting of Tangier is instead used as a two-dimensional backdrop for the central plot between Alice and Lucy. At no time did I ever feel the heat of the Moroccan sun, or hear the cries of the hawkers eager to take advantage of naive tourists coming on the ferry from Spain. Overall, this was an admirable debut effort, and I look forward to the next novel by Christine Mangan. 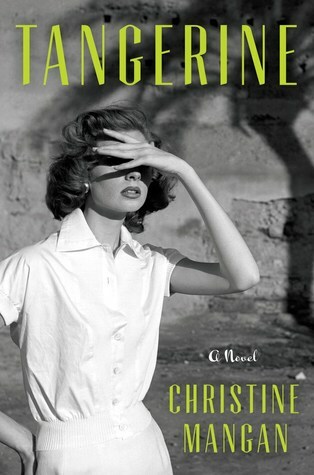 You can find Tangerine here on Amazon or here on Book Depository.